Instead of using an ordinary green-painted window box, why not make an artistic one in which the color does not clash with the plants contained in it but rather harmonizes with . Such a window box can be made by anyone having usual mechanical ability, and will furnish more opportunities for artistic and original design than many other articles of more complicated construction. 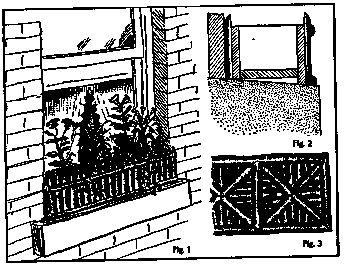 The box proper should be made a little shorter than the length of the window to allow for the extra space taken up in trimming and should be nearly equal in width to the sill, as shown in Fig. 1. If the sill is inclined, as is usually the case, the box will require a greater height in front, to make it set level, as shown in Fig. 2. The box should be well nailed or screwed together and should then be painted all over to make it more durable. A number of 1/2-in. holes should be drilled in the bottom, to allow the excess water to run out and thus prevent rotting of the plants and box. Having completed the bare box, it may be trimmed to suit the fancy of the maker. The design shown in Fig. 1 is very simple and easy to construct, but may be replaced with a panel or other design. One form of panel design is shown in Fig. 3. Trimming having too rough a surface will be found unsuitable for this work as it is difficult to fasten and cannot be split as well as smooth trimming. It should be cut the proper length before being split and should be fastened with brads. The half-round hoops of barrels will be found very useful in trimming, especially for filling-in purposes, and by using the operation of splitting is avoided. After the box is trimmed, the rustic work should be varnished, in order to thoroughly preserve it, as well as improve its appearance.